Product #16856 | SKU IOXT | 0.0 (no ratings yet) Thanks for your rating! 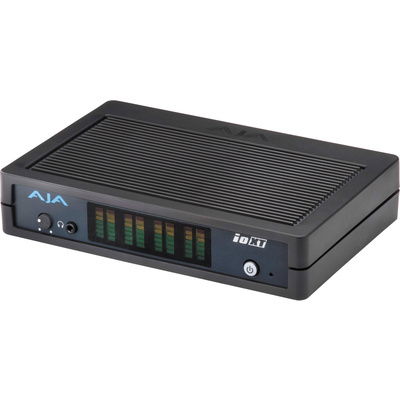 The Io XT from AJA is a professional 3G-SDI/HDMI capture & playback device that serves as an editing solution for Macs equipped with Thunderbolt ports. With extensive I/O choices including 4:4:4 RGB, dual Thunderbolt ports for ultra-fast (up to 10 Gb/s) connections to both an editing suite and a storage device, and hardware-based up/down/cross conversion for HD and SD formats, this portable device is a strong choice for directing video- and audio-signal traffic into and out of your Mac editing computer – whether a desktop system or a Thunderbolt-enabled MacBook Pro. The Io XT has dual 3G/HD/SD-SDI inputs and two such outputs; these pairs can also be used for dual-link 4:4:4 RGB I/O. Supported 10-bit formats of that type include 1080i, 1080p, 1080PsF, and 720p. The device can also convert between 4:4:4 and 4:2:2 to set up single-link HD-SDI monitoring and output. Speaking of conversion, the Io XT features a 10-bit, broadcast-quality motion-adaptive up/down/cross conversion, from HD to SD and vice versa, as well as between 1080 and 720 HD formats – even at filmic 23.98 frame rates involving progressive segmented frames (720p23.98 to 1080PsF/23.98). All conversion is hardware-based, so it's available always for either ingest or playback. HDMI I/O comes in the form of HDMI 1.3 in and HDMI 1.4a out, which includes support for 3D display for monitoring those stereoscopic projects. If the digital I/O capabilities of the device aren't enough, Io XT also features a full slate of analog audio and video ports, including 12-bit component analog video output. In addition, Io XT features a BNC for either LTC or reference input, as well as one for LTC output. The RS-422 connector enables machine control, so you can drive any traditional tape-based VTR via the Io XT. Of course the Io XT is compatible with the most popular Mac-based NLEs, and its drivers are optimized for OS X, so the application you're using can control the advanced hardware capabilities that AJA has built into the device. In addition, AJA Control Room software provides an intuitive, all-in-one way to control the Io XT in order to configure it for your own specific workflow, customizing the audio and video capture, conversion, playback, and output features. AJA Control Room supports a variety of video, audio, and still file types. Note: Thunderbolt cable not included.